“As Catholics, my wife and I were enjoined never to use abortion to destroy the life we created, and we never have. We thought Church doctrine was clear on this, and — more than that — both of us felt it in full agreement with what our hearts and our consciences told us. For me life or fetal life in the womb should be protected, even if five of nine Justices of the Supreme Court and my neighbor disagree with me. A fetus is different from an appendix or a set of tonsils. At the very least, even if the argument is made by some scientists or some theologians that in the early stages of fetal development we can’t discern human life, the full potential of human life is indisputably there. That — to my less subtle mind — by itself should demand respect, caution, indeed . . . reverence. Was Governor a coward for not trying to use his wonderous ability to persuade his liberal followers that abortion is just out and out wrong. I am not arguing that a woman doesn’t have the right to terminate a pregnancy, but more time should be spent by all arguing about the morality of such an act. Once again over 327,0o0 babies were terminated by Planned Parenthood in 2014. That’s a talent pool that was utterly wasted. The state of California has done it again – leading the way in all thing fascist and “progressive.” California has ordered any insurance company doing business within their state to immediately cover abortions. No exceptions. The new California law allows churches to receive exemptions from the contraceptive mandate – meaning that churches don’t have to provide contraceptives and chemical abortifacients — but they do have to provide surgical abortions! The law is obviously ridiculous and is already being challenged, but it’s a harbinger of things to come. The Alliance Defending Freedom (ADF) has filed complaints with the US Department of Health and Human Services and the California Department of Managed Health Care for the egregious trampling of religious freedom. Oregon State (four point favorite, at home) lost to USC 14 to 31! I guess third trimester abortions where the baby in a botched abortion is born live are ok! Imagine. He conducted and organized his anti-Planned Parenthood (PP) activities on his own time, and objected to the use of his classroom and his name for the PP propaganda. The Numbers Make Me Sad! Chinese doctors have performed more than 330 million abortions since the government implemented a controversial family planning policy 40 years ago, according to official data from the health ministry. In the U.S. since Roe v Wade in 1973 was passed, this country has conducted over 55 million abortions. In just over 40 years almost 400 million abortions, about 10 million every year, over 27,000 abortions every day, over 1,000 per hour, day after day after day. That’s like wiping out every human that lives in the U.S. I don’t want the government telling us what a woman should do with her body, but can’t we see that this is murder? Yesterday, was the 40th anniversary of Roe v Wade. Since then 55 million babies have been killed, about 1.3 million a year. Last year alone Planned Parenthood was responsible for 330,000 deaths alone. 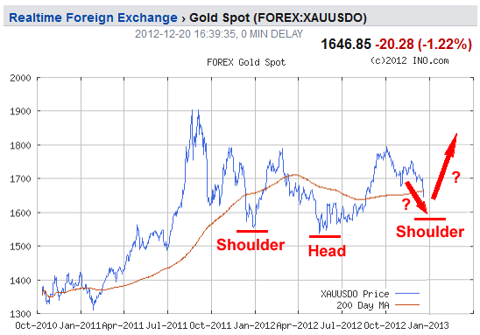 In 2010, I predicted Gold would go up for the 11th straight year to $1,704!. It overshot my target by reaching $1,920. While it finished soft at $1,564.80, I predicted we will trade at least as high as $2,000 in 2012. Gold saw a high of only $1798.10 in 2012, but the year end close finished at $1658.40 $1,675.80. That close is the 12th year in a row that Gold finished the year higher than the previous year. That’s a gain of 5.8% 7.0%! I predict for 2013, Gold will break the old high of $1920 set in 2011 and power our way to $2300 and finish higher for the 13th year in a row. UPDATE: I was fooled. I thought the last day of trading for 2012 was Friday. That’s why the changes. Gold finished today up $19.50! The monthly, weekly and daily trends of both Gold and Silver are now down with the failure of support at $1672.40 for Gold and $30.64 for Silver. Major support for Gold is $1500 and $25 for Silver! The good news comes from Tim Iacono who opines that we may be forming a massive head and shoulders bottom. “…if the other shoulder forms, that means that the correction that began 15 long months ago could soon come to an end and the gold price will f-i-n-a-l-l-y break free of its $1,550-to-$1,800 an ounce shackles.